The look of shock on my face must have been pretty obvious. “Yes — a qigong teacher,” I said. This conversation happened while I was waiting in the security line at the airport in Costa Rica. The woman was a complete stranger, and just happened to be standing in front of me. She had no idea about me or my work. Two minutes earlier, with no prompting from me, she had started talking about the philosophy of qi. I felt like I was in the Twilight Zone. That’s why I looked shocked, and why it took me a moment to respond. Back in the 1990s, when I first started practicing qigong, no one knew about it. My conversation in the airport would have been inconceivable back then. Today, more and more people are interested in learning about the Chinese concept of qi. If you want to learn more about qi, then sooner or later, all roads eventually lead to qigong. And this makes sense because qigong translates to “the art of cultivating qi”. Whether you are an acupuncturist, a massage therapist, a reiki master, an energy healer, a psychic, a yoga practitioner, an interior designer (who uses feng shui), a spiritualist, or even a pianist — you can benefit from learning about qi. 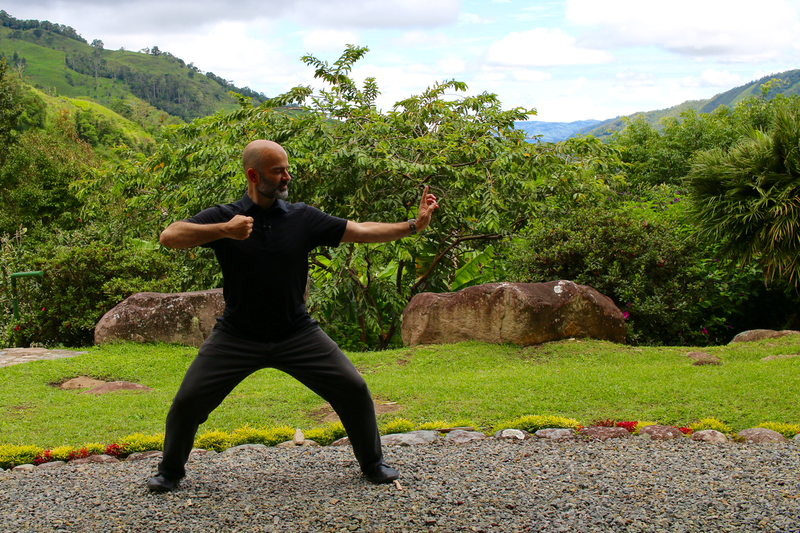 If you study qigong long enough, you’ll learn to do different things with your qi. For example, you’ll learn how to circulate it in your body, and also how to direct it to your hands. In short, there are only 12 different ways that you can cultivate the qi, and I’ll explain each of them here. Remember that the dimensions are not linear, but rather circular. A lifelong practice of qigong will involve many laps through the 12 Dimensions, going deeper and deeper with each successive lap. Also, remember that the 12 Dimensions are universal, meaning that they will apply to all schools of qigong. Different schools may use different techniques and different terms, but the dimensions are still the same in essence. 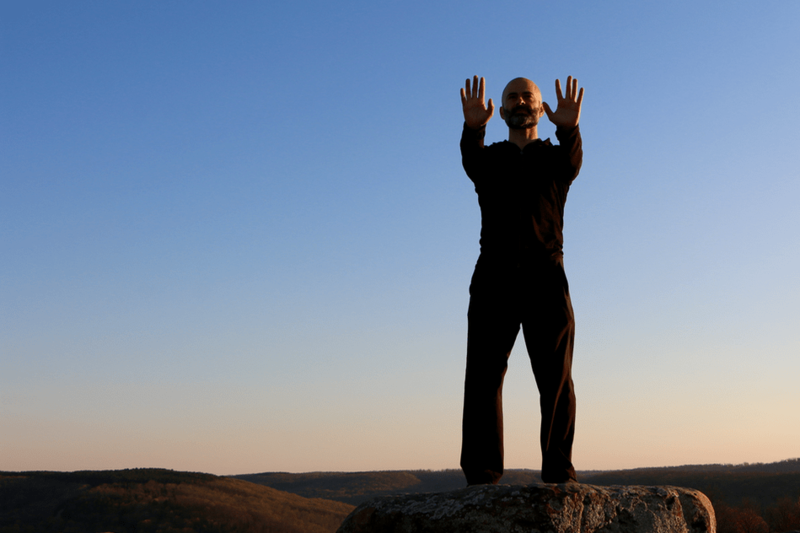 To go deeply into qigong, you need to become more sensitive to the qi in general. In other words, you must discover the qi that already exists in and around your body. Discovering the qi is a gradual process of quieting the mind, relaxing the body, and heightening the internal awareness. In my school, we have a series of techniques that we poetically call Entering Zen. We Enter Zen every time we practice our 5-Phase Practice Routine. The smooth flow of qi is critical for health and happiness. Once you learn the skill of circulating the qi, you’ll want to continue practicing it for the rest of your life. Circulating the qi is what brings fast results, especially in terms of pain management, improved digestion, emotional healing, and immune response. It’s also what makes you feel energized. In my school of qigong, the primary way that we circulate the qi is with a beautiful and rare technique called Flowing Breeze Swaying Willow (phase 3 of the 5-Phase Practice Routine). If your physical structure is not aligned, if your muscles, tendons, fascia, and ligaments aren’t working optimally, if your spine is unhealthy — then you’ll never master your qi. You need to gradually build strength, flexibility, and balance in order to realign your structure and thus your qi. 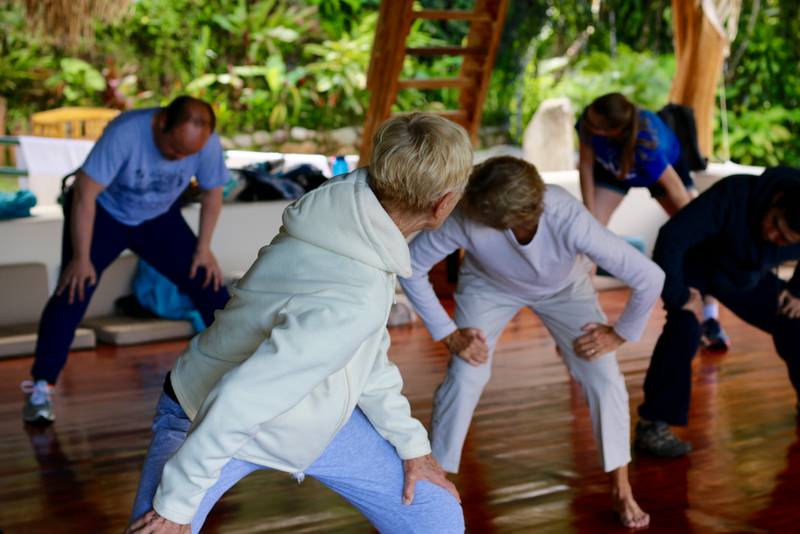 Luckily, qigong helps people to accomplish this regardless of their fitness level or age. In my school, we use a variety of qigong techniques to align the qi, mainly from the 18 Luohan Hands. Now that your qi is flowing well, you can start to work on gathering more of it. Qi is the main ingredient in this art, so having more of it is definitely useful! This skill also unlocks greater possibilities with the later dimensions, especially consolidating, transforming, and transmitting the qi. In my school, we use the Warrior Stances (zhan zhuang) as our fundamental method for gathering qi. External factors can have a negative influence on your qi — the food you eat (or don’t eat), your lifestyle habits, your environment, even your finances. No matter how good you are at the other dimensions, no matter how much you practice, you’ll plateau in your development if you don’t protect your qi. In my school, I help students to improve their sleep hygiene, their diet, and also to get rid of negative habits (like smoking). Whereas Protecting the Qi is focused on external influences (like the junk that we eat), Purifying is focused on internal influences (like the junk that we think). To reach higher levels of qi mastery, you must purify your thoughts and emotions. In my school, we have a variety of techniques and meditations for purifying, including 1% Forgiveness Meditation, Loving Kindness Meditation, The Gratitude Spark, The Five Animal Play, and Dispelling 1000 Thoughts. Masters of the internal martial arts (like tai chi chuan) know how to mobilize or summon the qi in an instant. But it’s helpful to learn how to mobilize the qi even if you have no interest in martial arts. Mobilizing the qi is a more forceful expression of energy. This skill helps you to get in touch with the spirit of the peaceful warrior, which will make you more courageous, more decisive, and help you to draw better personal boundaries. In my school, we usually mobilize using techniques from The 18 Arhat Arts, and also One Finger Shooting Zen. You can’t call yourself a master of qi unless you can easily direct the qi to any part of your body, including any organ. Although this may sound fantastic to beginners and skeptics, it’s actually a natural progression. Most students can do this easily after 6-9 months of dedicated practice. In my school, we use different techniques to direct the qi to different areas. For example, we use Nourishing Kidneys to direct qi to the kidneys, Pushing Mountains to direct qi to the hands, and Separating Water to direct qi to the lungs. Gathering the qi isn’t enough; you also need to consolidate the qi in the major energy centers, or dantians. This dimension goes hand-in-hand with Gathering the Qi, but is more focused on storing the qi rather than just gathering it. If you’ve been practicing qigong or tai chi for years but still can’t feel the golden sphere of energy at dantian, then you need to spend more time consolidating. In my school, we do this in phase 4 of the 5-Phase Practice Routine. We also use other techniques, including Three Centers Merge, Dantian Breathing, and various visualization techniques. The Small Universe (or Microcosmic Orbit) is a famous qigong technique for transforming qi (energy) into jing (essence) and shen (spirit). In many ways, all other forms of qigong are child’s play compared to this dimension. Some schools differentiate between qigong (energy cultivation) and neigong (internal cultivation), but that’s just semantical. The two best techniques for this are the Small Universe and the Big Universe. The longer you cultivate your qi, the more often you’ll merge with the cosmos, often without even trying. Most meditative traditions aim for a blissful state of union with the infinite, the Tao, Shiva, the cosmos, or God. Sitting meditation is a great way to access this state. If you already have a sitting meditation practice, practicing the previous 10 Dimensions will take it to a whole new level. In my school, we also use Sinew Metamorphosis techniques and the Small Universe to unify the qi. In the 12th dimension, we complete the cycle by giving energy back to your fellow humans. Qi can be transmitted from the hands, and also from the heart. When I teach, when I share these beautiful arts with others, I’m transmitting qi from my heart. I also do hands-on healing, but to this always compliments my teaching. To me, teaching a d healing are yin and yang, and they should always go together. In my school, techniques for transmitting the qi for the purposes of healing include: The Sword Finger, Cosmos Palm, and One Finger Zen. As you learn about the 12 Dimensions, make sure that you understand the difference between skill and technique. Techniques are visible; skills are not. When we’re talking about the 12 Dimensions, we’re talking about skills. Like most skills, they are largely invisible. On the other hand, if I use a qigong technique called Shooting Arrows, the physical form is pretty obvious. My body is moving in a particular way (see below), and it’s visible. In other words, Shooting Arrows is a great technique for the skill of directing the qi to the index finger. But the skill and the technique are separate. Example #1: Mary is performing the qigong technique called Shooting Arrows, but she is unable to direct the qi to her index finger even though the physical form of the exercise is correct. Example #2: Laura is performing the qigong technique called Shooting Arrows, and she is able to direct the qi to her index finger. Example #3: Jane is standing upright and motionless with her eyes closed. She is not performing the technique Shooting Arrows, but she is nonetheless able to direct the qi to her index finger. Can you see how the technique and the skill are different? Can you see how one can happen (or not happen) with the other? One final example: I can use the qigong technique called Pushing Mountains for Dimensions 1 (Discovering), 2 (Circulating), 4 (Gathering), 8 (Directing), and 12 (Transmitting). To you, it would all look the same. It would just look like Pushing Mountains. To me, Pushing Mountains would feel totally different depending on what I’m doing with the qi. The 12 Dimensions are a useful way to understand the various classical skills of qigong. Regardless of the style of qigong that you practice, you can conceptualize the skills using the 12 Dimensions of Qi Mastery. This will help you to master the qi. And when you master the qi, you master not only your health and vitality, but your entire life. Now I’d love to hear from you. Did you find this helpful? Do you have any questions? Go ahead and leave a comment below! Great Blog Sifu! Very helpful! Always interested in learning more about the 12 dimensions.Thank You! This article was great. I hope you will share more. I am enjoying this class more than I can say. Thank you! I find Qigong fascinating, enjoy working with it & incorporating it into my life. I love he way you introduce the layers & depth of this beautiful art in your teachings. You do it in such a way…the timing seems right. I am very interested in the 12 dimensions………along with everything else you can share with us about Qigong!!!!!! I really liked what I just read. Thank you for that. I would also love to read more about each of above mentioned dimensions. I love to read your thoughts and knowledge. Even though I’m an ocean away I receive a great sense of strength from reading and listening to you. I practice tai chi and qigong and have done for seven years and I thrive on the knowledge you share. Thank you and let there be more. Thank you, Linda! I’m so glad this was helpful! You just enriched my practice, my knowledge,and my teaching! And I love you for this! ….of course I want more in depth and praying one day to come study with you. Thank you from the heart! I do not know how to thank you! My Qi gong practice has expanded immensely with Qi dimensions conscientiously and full,awareness.how priceless! I enjoyed reading every bit of your post. I found it very intriguing. I just want to THANK YOU for allowing me to be one of your students! I look forward to reading all of your posts. Thanks immensely! Thank you for the great detail of qi…I have an interest in learning and practicing these methods and you are helping me with clarification…great work! Hi, thank you for your insights! 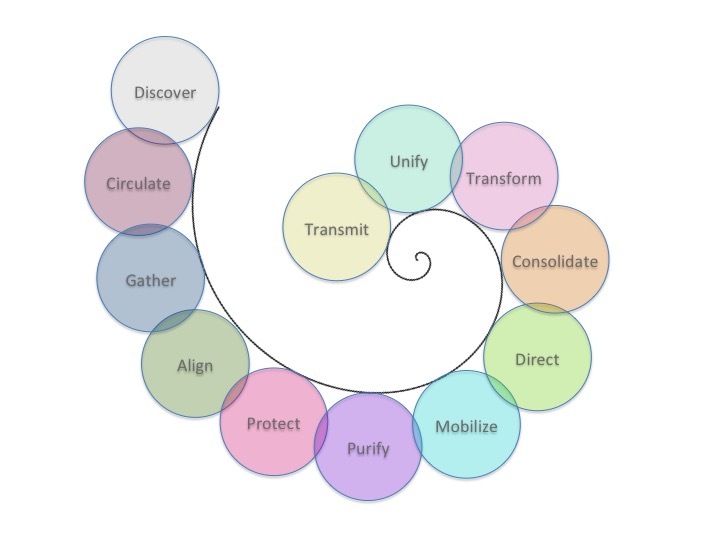 I just started reading Roger Jahnkes Healing Promise of Qi, I think he identified very similiar phases. Would you like to share how you came to your 12 dimensions? That would be interesting to compare! Hi Angelika. It’s a great book! In another post, I link to that book and mention that years ago Dr. Jahnke’s 10 Phases were my original inspiration for the 12 Dimensions. Based on my experience and my understanding of the classics, I added 2 phases — Aligning the Qi, and Mobilizing the Qi. Also, many of my teachers talked about the 12 Dimensions, although using different terminology, and without organizing them into a neat chart. Thank you, as always, for sharing your knowledge Anthony. Besides traveling to Costa Rica, is there any way that a person could start studying under your system now? I’ve seen your new online academy but wasn’t sure whether or not you were going to introduce an “intro” class of some kind. Hi Logan. I’m just getting started with Qi School, which is my new online school. I’ll have lots of options there in coming months. It looks like I will also be teaching in Mexico City, New Mexico (Clovis), and possibly also Arkansas later this year. Details coming as soon as I have them. Very interesting blog – I would love to read more about this! Thanks for putting together this amazing blog. I have been doing lots of research on qi philosophy lately and I think you’ve explained the qi phenomenon and cultivation steps quite clearly. Thank you for the kind words, Ricardo! I’m glad it was helpful! It looks like I’ll be teaching in Mexico City on October 1st, if you are interested. Details coming soon. I would love to know more about “Three Centers Merge”. I never heard about it before. Davy, it’s a technique that uses a hand posture similar to a mudra to consolidate energy at the lower dantian. Very effective! I took your beginners class a few years ago. Would I be able to take this class or should I wait for another beginner class? Hi Janis. Good to hear from you. Which class are you talking about specifically? Sorry. The class in AR. Janis, sure! If you remember Flowing Breeze Swaying Willow, even if you’re rusty, then you qualify! I hope to see you there! wow this is amazing! thank you sifu anthony! I want to be able to learn this. how do I begin if I am living far away from america? i also also have sent an email to you. Hi Suyog. I’m still catching up on emails after the hurricane here in Florida. I’m working on a new online program that I plan to release in late November. 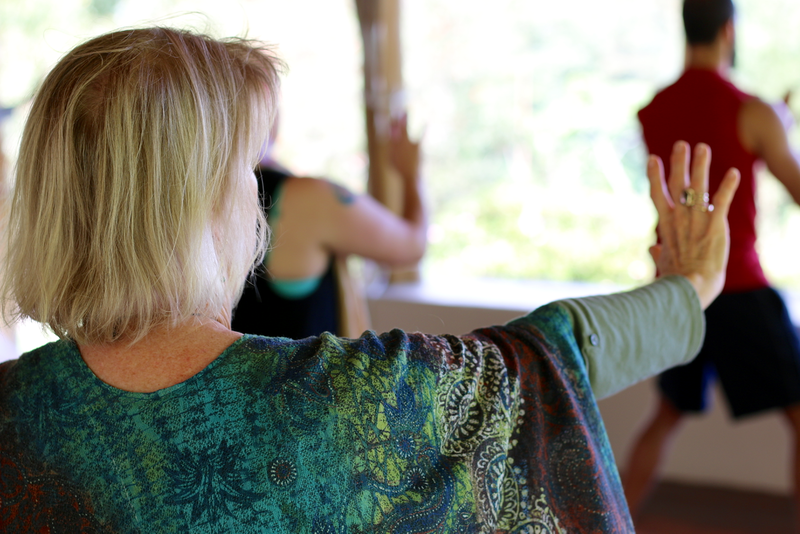 This program will guide you step-by-step through all of the secrets to healing with qigong. It will be a mix of on-demand and live online components, and I think it will be perfect for you! Well. That’s an interesting article. Hope to find more articles like that Here ! It explains a lot of things i always wanted to know in instant. Great article will read as much as you can write, please keep writing and thank you.. So much wonderful information! I think my head is going to explode!!! : ) I enjoy all your articles very much, that is why I print all of them and place them in binders to add to my reference library. Your contribution to the study of qigong, and passing it on to keep it alive for future generations, identifies your mission in life. Sifu Anthony you should be very proud of your accomplishments in this field of study. Keep writing! I am so glad to read this. It gets me super excited about practising Qigong. I love kung fu movies too — but they aren’t real. You can’t push away soccer players with your qi. That’s fantasy, not reality. On the other hand, qigong can absolutely make you a better soccer player — stronger, faster, more relaxed, more in the zone. When FIFA discovers the power of qigong, all of the players will want to learn! I kind of understand what you are saying, Sifu, but I don’t know how to “conceptualize the skills using the 12 Dimensions of Qu Mastery”. I don’t know how these skills are learned. At this point, I seem to be sensing the qi in my hands, arms (a little), jaw, and brain when I do the techniques you are teaching us in 101. I also find that my feelings of impatience, frustration, agitation, and anger are dissolved when I do the techniques with softness of heart/mind. I don’t know if this is also sensing the qi, or simply a by-product of how the techniques make the qi flow in a nicer way. I am willing to read about how these skills work, but I don’t know “who” to read, or even if these skills can be described/discussed using our vocabulary. I only know that these skills exist; but not how to go about acquiring them. Thank you Sifu for all this beautiful learning opportunity. wow I am very happy, I have the privilege to understand and go much further in the Art of Qigong.